Douglas Crystal, the at fault driver in the crash that killed Meranda Baguss, is shown here in his September 2017 mug shot from the Kent County Correctional Facility. 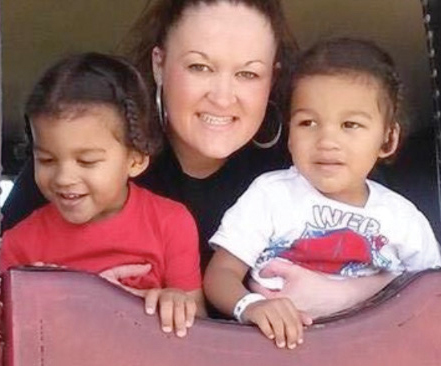 Meranda Baguss, who was killed in a car crash last September, is shown here with her twin boys, who were injured in that same crash. Photo from gofundme.com. A Cedar Springs man that fled a crash last fall that killed a Sand Lake mother and critically injured her twin 5-year-old boys pled no contest this week to felony charges in the case and will now wait to be sentenced. 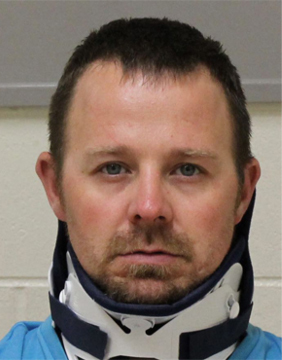 On September 15, 2017, at about 8:23 p.m., Douglas Crystal, 36, was traveling northbound on Ritchie Avenue at about 90 mph in his Ford F150 when he failed to stop at the stop sign at 15 Mile Road and slammed into a 2011 Ford Fusion traveling westbound on 15 Mile Rd. The crash killed the driver of the Ford Fusion, Meranda Baguss, 33, a 2003 graduate of Cedar Springs High School. Her five-year-old twins, Chauncey and Tony Anthony III, were in the back seat in their car seats, and were critically injured. They were taken to Helen DeVos Children’s Hospital in Grand Rapids with life-threatening head injuries. Crystal, who was reportedly on his way home from a golf outing, fled the scene. He hid from police for about 8 hours before finally being arrested. On Monday, April 9, he pled no contest to charges of operating while intoxicated causing death, a 15-year felony; failure to stop at the scene of an accident causing death, also a 15-year felony; and operating while intoxicated causing serious injury, a five-year felony. He is expected to be sentenced May 3.